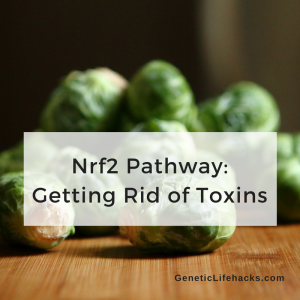 The Nrf2 signaling pathway regulates the expression of antioxidants and phase II detoxification enzymes. I think of it as flipping the switch to call up the phase II enzymes to take out the trash produced in phase I detox. The phase II enzymes then further break down the metabolites from phase I detoxification, making them into something that can be excreted by the body. Specifically, the Nrf2 signaling pathway is involved in GSTs, NQO1, UG/Ts, and SULTs. Variants in the NFE2L2 (Nrf2 pathway) gene are fairly common, with some variants increasing Nrf2 pathway signaling and some diminishing it. Some of these are being studied in relation to cancer prognosis, lung volume in smokers, and Parkinson’s disease. Sulforaphane, a natural substance found in broccoli sprouts, Brussels sprouts, cabbage, cauliflower, activates the Nrf2 pathway. [study][study] Broccoli sprouts are supposed to be one of the best sources of sulforaphane that you can eat. There are also sulforaphane supplements available. Be sure to get one that includes the myrosinase enzyme such as this one from Jarrow.